The following is a post I just made to the Wolfe Mailing List and thought it would be good to archive here. Just reread In the Best Families and noted a couple of points that I thought were interesting. I seem to remember at least some of this coming up in discussion before but a quick search in my very limited email archives didn’t show anything so thought I would post this. The copy I read this time was the Bantam paperback 8th printing printed in Sept 1984, and that’s what the page numbers I am giving are based on. On the main point of interest, could she and did she pay her bills, the news was favorable: she was worth a good four million and maybe five. Calling it four, and assuming that Wolfe’s bill for services rendered would come to only half of it, that would be enough to pay my current salary – as Wolfe’s secretary, trusted assistant and official gnat – for a hundred and sixty-seven years; and in addition to that, living as I did there in Wolfe’s house, I also got food and shelter. So I was fixed for life if it turned out that she needed two million buck’s worth of detective work. So in a round about way he tells us how much he makes a year. 2 million divided by 167 is $11976.05 if we round up and $11976.04 if rounding down. From that I am assuming he means he makes $12,000.00 a year which breaks down to an even $1,000.00 a month but if taken even further and divided by weeks is not quite so even and comes to $230.77 a week. Any way you figure it, in 1950 dollars that is a nice little pay check. I used the Consumer Price Index based financial calculator at http://www.minneapolisfed.org/ to do a bit of figuring on what he would be bringing in today. According to the site the following is how they do the calculation. Which would put his yearly salary at $106,157.68. Not bad for a gum shoe! And that’s NOT figuring in room and board which in New York City would be a hefty sum! Pierce was a smooth article. His manner was, of course, based on the law of nature regulating the attitude of an elected person toward everybody old enough to vote, but his timing and variations were so good that it was hard to recognize it, although he was only about my age. And goes on with Pierce’s description, but the above was the part that interested me. Archie is telling us that he is about 34 years old. Now the first book in the series, Fer-de-Lance, was written in 1933 and this one, In the Best Families, was written in 1950, which gives us 17 year’s between them. Extrapolating from the above statements that he is 34, he would have been 17 when the first story came out and would have been born in 1916, neither of which fit in with other bits from elsewhere in the corpus. So either he is not telling the truth about his age (Not that Archie would EVER prevaricate!) 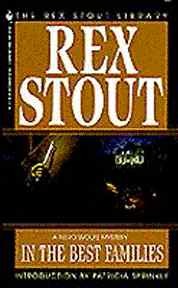 or as has been discussed in far greater depth than I am prepared to go into here, Stout changed their ages to suit his self as the series progressed. As I said just a point I found interesting. All in all a very good read and I quite enjoyed rereading it. Comments, corrections, and discussion welcomed. 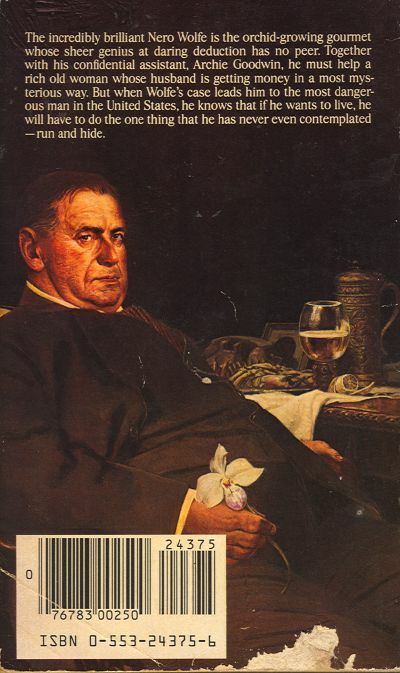 The incredibly brilliant Nero Wolfe is the orchid-growing gourmet whose sheer genius at daring deduction has no peer. Together with his confidential assistant, Archie Goodwin, he must help a rich old woman whose husband is getting money in a most mysterious way. 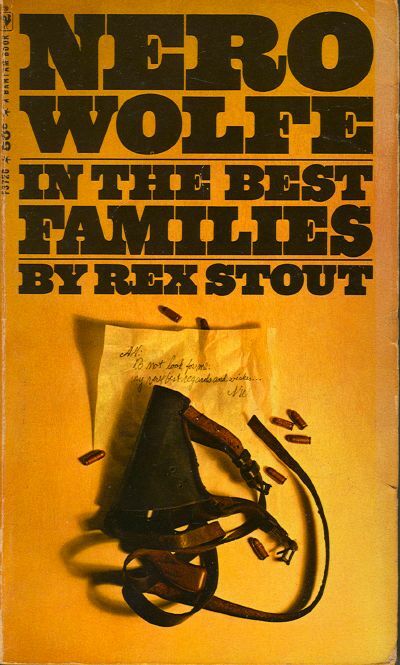 But when Wolfe’s case leads him to the most dangerous man in the United States, he knows that if he wants to live, he will have to do the one thing that he has never even contemplated — run and hide. Note the similarity’s between this cover and the earlier 1968 cover. 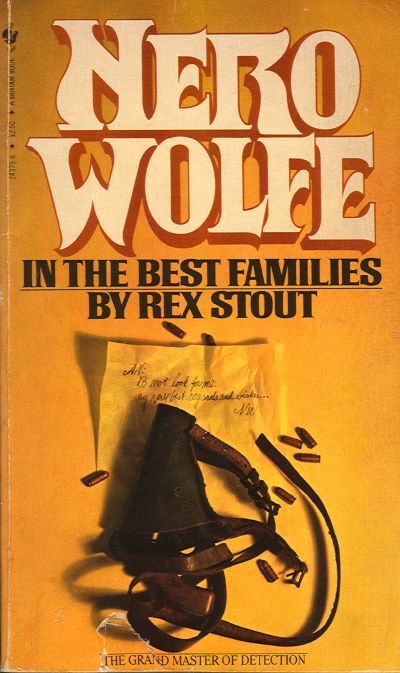 The cover graphic seems to be the same with a fancy font for Nero Wolfe. In The Best Families – 19?? 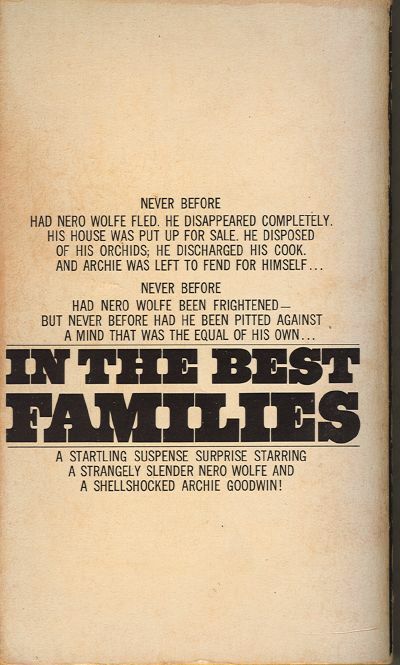 In The Best Families - 19?? Publishing date unknown but, this cover appears to be one of the late 1980’s or early 1990’s editions.